Please read my shop policies before making a purchase. By making a purchase from my shop you agree to my policies. I sell crystals and gems at http://coyoterainbow.etsy.com and can make custom wire wrap jewelry out of the stones there. I accept Paypal, US Postal Money Orders, any credit card through Google Checkout or Amazon Payments ... and i can take a check if that is the only way you have to pay but it may take a few days to deposit and a few more days for the check to clear. I will do all I can to ensure good communication, satisfaction and safe delivery of your items. Please read my policies on shipping and payment to make sure that we can cooperate in this. If you are considering a purchase, please agree to honor my policies. Please do not purchase from me unless you agree to these policies which are intended to protect all parties involved. I will NOT make exceptions out of fairness to all. Every one of my items for sale include a link to these policies, and the statement that by purchasing from my store, you are agreeing to these policies. We want your items to reach you safely. The price that you pay to purchase your item is based on these policies and not any other assumptions. All sales are final. I do not do returns and refunds. This is a similar policy to many jewelry stores in malls and other locations, and also, most of my items are made to order after you commission a piece from me. Thank you for understanding. If my policies were otherwise, then my prices would have to be different and therefore please do not ask me to make exceptions. I order precious metals based on the number of sales that come in. Also, if your purchase is based on a condition, such as assuming i can do something different on your order than is stated in the listing, please do not place this condition in "Notes to seller", please contact me before placing your order. I love to do custom work! For items under $100, payment in full is due before I begin. Orders over $100, I will ask for at least half up front for a deposit. This deposit is NON REFUNDABLE even if you cannot complete the purchase. I will take care of any taxes and fees. I accept Paypal, any major credit card through Google Checkout, Direct Checkout through Etsys credit card system, and US Postal Money orders purchased at your post office. It is very important that you use the correct address with your payment. Otherwise we will not be able to be responsible for items that are redirected due to an incorrect Paypal or direct checkout credit card address. For orders in the US, I will purchase insurance on orders over $100. In order to save shipping costs for my customers overall, a customer who wants insurance for an order under $100 will have to request insurance at an additional charge if you would like this protection. You may contact me before purchasing, or if you write in "Notes to seller" that you would like to purchase, I can set up a listing for you for the additional charge. All International Packages over $20 will be sent with insurance as of Oct 26, 2012 and the shipping price on the item already covers this charge. You must be willing to wait 60 days before we can file a claim due to the policies of the insurance company Etsy uses. Please read all of our shipping policies, below. Tracking info is available and delivery confirmation if you live in the United States. If you need tracking information and confirmation for an international delivery, there will be a substantial extra charge because we will have to move up to Priority shipping. If you are ordering more than one item from me, I usually offer combined shipping, if you are purchasing within one transaction or we have made arrangements for combined shipping beforehand. Upgrading to Priority Mail within the US is available - just contact me at mandalarain [!at] gmail.com to arrange this. Overnight mail may also be available. My prices for my items are what they would cost if you were to pick the item up local . My shipping and handling fees are intended to at least PARTIALLY cover the cost of postage, mailer, bubble wrap, box for the item if applicable, printer ink and paper, etsy listing fees and percentage for sale, paypal fees, gas to the post office, time spent waiting in line, filling out custom forms, etc.. as well as insurance on international items. Also I have found that some countries require that international packages be picked up at the post office or they return them to the sender. If you are wondering what is going on with your international package, PLEASE check your local post office. If your package is returned to me because you do not pick it up, I can resend it but you will need to pay for shipping again. Again, please contact me if you would like to purchase insurance on an order under $100 US, or under $20 in another country if you would like this protection against damage or loss in shipping! If you are not sure about an item before purchasing, please ask all necessary questions or ask for additional photos or information before purchasing as we do not accept returns under any circumstances other than an error in sending the wrong item. If you think you might want to return an item, it is probably best not to buy it here. If you need clarification before purchasing, please ask. Due to the nature of my business, returns and refunds are not services I provide. Except in rare cases, all items are shipped USPS. (Sorry, no COD's). Please allow at least 1-2 day packing/handling time before shipping to ensure that your pieces can be packed with the care that they deserve. It is very important that you provide the correct address with your payment. We print our shipping through Paypal for the most part, so if you have provided an incorrect address to Paypal or the credit card system, this might cause some serious problems for you. If you send us an address change after placing your order, there is no guarantee it will reach us in time so please take care to provide the correct address at the time of ordering. UPS may be used at our discretion when shipping extreme weight. If you have given us an incorrect address, and something is sent back to us, and it needs to be reshipped we will have to charge you for shipping again. ALL Items shipped within the United States will be shipped with Delivery Confirmation, by either Priority mail or First Class mail at our discretion. This is the basic service that we provide. If you would like insurance or Signature Confirmation for orders under $150, you must arrange to purchase this by contacting us through Etsy conversations, in notes to seller, or in email to mandalarain [!at] gmail.com . We will carefully pack and send your items, but if you are not willing to accept the possibility of loss due to error by the post office, please request to purchase Insurance. Building insurance prices into the cost of shipping every item automatically would result in a cost that most people would be unwilling to pay, so I have made this optional. .
Orders over $150 will automatically include Insurance and Delivery Confirmation in the shipping price. Orders over $300, we will automatically include Insurance and Delivery Confimation plus we WILL require Signature Confirmation, so we will be in touch to make sure that this can be arranged. This is to make sure that you and only you will receive your items. International Orders will be sent by International First Class mail with insurance. International purchases over $150 will be sent by International Priority mail. There is NO WAY for First Class International mail to be tracked. By purchasing from our store , you are accepting the risk that items may be confiscated by Customs or lost in the mail. As of October 26, 2012 we will be purchasing shipping insurance on all international orders over $20. If you would like to purchase insurance on an order under $20, please arrange to do so with myself, the seller. International orders over $150 will be sent by International Priority Mail with Insurance. International orders over $500 will be sent by the most secure method within reason available for the weight and size of the items, and we will discuss and agree on a shipping method with the buyer before the items are sent. Typically this will be Global Express mail with Insurance and Signature Confirmation. Please realize that we have no control over whether your postal system decides to charge duties or customs fees on your items, and you are responsible for paying these fees. In some countries (especially Germany for some reason) your post office may hold an international package at the post office for you to pick up in person and they may not even notify you of this, so please if you have not received your package, please check at the post office. If you do not claim your item from the post office and it is returned to us, you may be required to pay for postage again. So if you have not received your package, please check with your post office. If you need any information from us such as the address we sent the package from, a description of the package, or the customs form number just let us know. I can arrange for insurance for a very reasonable charge. Due to the nature of a business based on made to order custom items, and jewelry items, I do not do returns or refunds under any circumstances - if you are not sure about a purchase, please ask for additional pictures or information before making the purchase. If you are worried about potential loss or damage during shipping and handling, please inquire about insurance which is a reasonable optional charge. If you are looking for a seller that does returns or refunds, I respectfully ask that you do not purchase from this particular business. I have set my prices in accordance with my policies. If i was willing to do refunds and returns, then I would have to take this into consideration. I believe in applying these policies without exception to be fair to all my customers and keep costs down. For example, a wedding dress store doesn't have to allow you to return items, nor do many jewelry stores in retail locations. This is how I choose to run my business as well. With custom items, I do NOT do refunds or returns. If there is something that is important to you in your piece, please describe this to me when you are placing the order so i know. The ONLY circumstance under which a Return / Exchange can occur is if we have sent you a blatantly incorrect item. We will provide you with convenient return shipping options to return the item to us at our cost, in the original condition that it was received by you, and we will send you the correct item. The ONLY circumstances under which a Refund will ever occur is if you have purchased insurance for your item and it has been damaged or lost in shipping as evidenced by tracking information. If a mistake has been made in a piece, I will send you a prepaid label that you can print and send back to me, and i will fix it and send it back to you. I will include a free gift for your help. I do everything i can to prevent error but due to the nature of the pieces I make, it does happen from time to time. All sales ARE Final. We do not offer returns for people who may change their mind. If you are not sure about an item before purchasing, please ask all necessary questions or ask for additional photos or information before purchasing as we do not accept returns under any circumstances other than an error in sending the wrong item. If you need clarification before purchasing, please ask. If you would like custom work done, or if you have any questions, or are in need of a gift for someone who is difficult to shop for, please contact me, and I am happy to discuss! Unless you purchase Insurance on the item, I will not be responsible for damage caused during shipment. We will do our best to ensure that your items will reach you safely, but unexpected events may occur due to mishandling by the Postal service. In the event that Insurance is purchased, please notify me immediately and I will file a claim form and have the money refunded directly to the Buyer. Most Postal Office's will generally pay the refund amount at the time the item and claim form is presented. I combine shipments for customers purchasing more than one item. Usually there is a base price and an additional $1.00 - $2.00 per item priced according to weight and any additional packing considerations. Sometimes I may not be able to combine items in one shipment, due to size and weight differences or other considerations . Naturally, I do not place a very delicate and small piece in the box with a much larger and heavier piece . In these few instances, I will send you an e-mail advising you of my decision and why. I reserve the right to make this decision in the best interest of all concerned. Shipping costs are not only the actual dollar value of the postage paid to the post office but are also partially covering our cost to deliver your items to you including such materials as bubble mailers, bubble wrap, printer ink, paper, packing tape, fees, and more. The cost of the item is what we would charge for the item itself if someone were to buy it from us in person. All of these policies have been carefully thought out in order to ensure the safe and accurate delivery of orders. If you have any questions please let us know. By purcasing from my shop you agree to honor these shop policies . 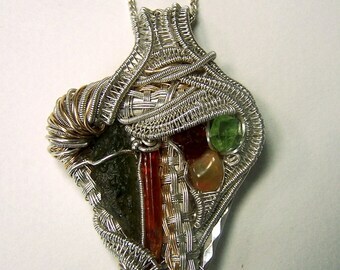 I started wire wrapping while attending college as a double major in Art and PSychology. 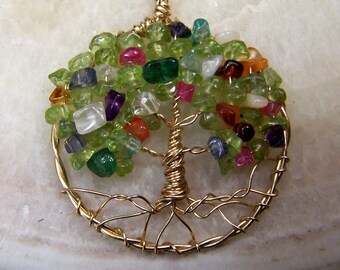 I love the symbolism of the Tree of Life and am fascinated by ancestry and exploring family heritage and so the birthstone family tree is a powerful symbol for me. 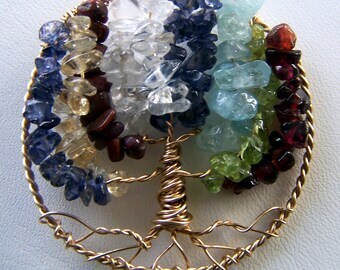 Interested in exploring the relationship between stones and wire. I care deeply about sustainaIble living on my small farm in Southern Oregon. Homesteader, homeschool mother. I enjoy participating in Native AMerican powwows.